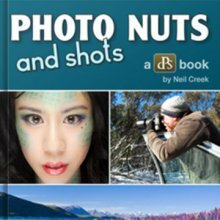 Need some ideas for photography poses for 4 people? This article will give you several examples of poses for 4 people that you can copy as well as the 3 best tips for posing groups of this size. 1. GROUP OF 4 POSING TIP. As with all poses of 3 or more people, it makes a more pleasing portrait to have the heights of your subject's heads at different levels. 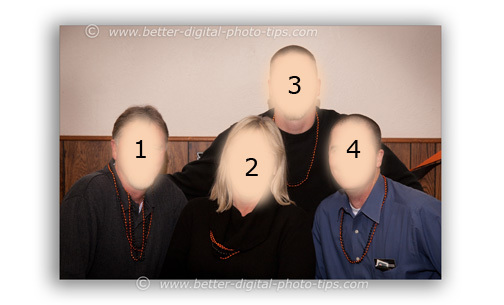 This photo of a family group of 4 was from a photography job I did in a church basement. 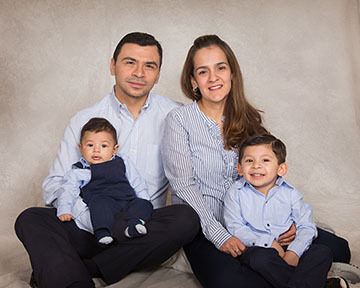 There was not enough time for formal posing with posing stools and a background, so I only had folding chairs and a few small foot stools that I brought along to use to help pose my small family groups. The pose above was of 4 adult siblings. I sat the sister between 2 of her brothers on folding chairs. I had the third brother kneel on one of the foot stools behind the other three. This way the female was surrounded by her brothers. 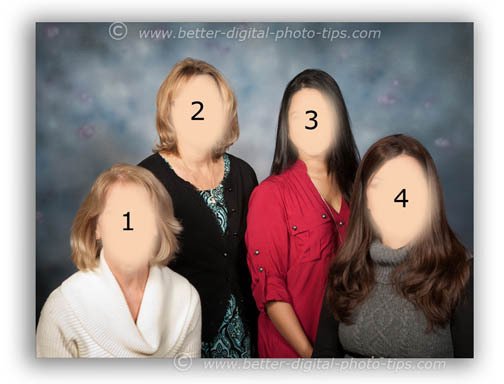 If you connect the heads in this order: 1-2-4-3 and back to 1, you see we have a flattened diamond shape which I often use with photography poses for 4 people. 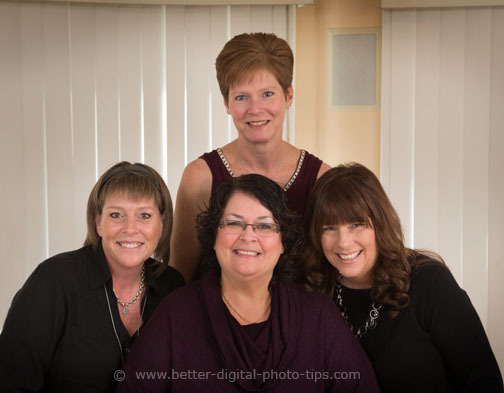 Think about using geometric shapes like diamonds, squares, and triangle when you compose your group shots. The family was quite pleased with the arrangement, but what could I have improved on? I could have had male #1 sit on a book on the chair to raise his head perhaps 2 or 3 inches. 2. 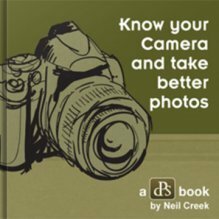 THE SECOND TIP is to have your subjects turn at a slight angle to the camera, often a 30 to 45 degrees turn from shoulders facing directly at you. The pose below was a completely different situation. It was an office party at a restaurant. I had just enough room to set up a medium-sized background and two umbrella lights. I had the two shorter ladies stand behind and between the two taller ladies who sat on posing stools. This created that pyramid shape that is a composition technique widely used in group portraits. Usually adult women prefer that their bottoms do not show in portraits and this is a pose that accomplishes that. The 4 children sat in a straight line along rocks near the ocean. 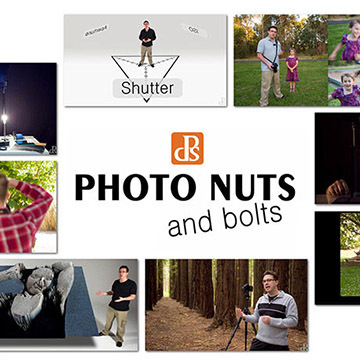 Photography poses for 4 people are usually not done by having all the subjects sitting in a row next to each other. I wanted the pose to be a little more natural and less structured for these 4 cousins enjoying the beach. I purposefully did place the two taller children in the middle of the composition to create that pyramid shape that has been discussed in some of the photography articles on family and group posing tips on this site. Another posing tip is to make sure everyone's hands are not in the same position. Notice that each child has there hands placed in a different way. If there hand were posed in the exact same way it would like like a police lineup. 3. THE THIRD POSING TIP. 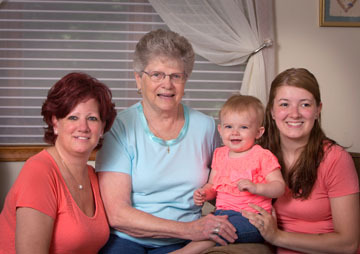 If you want to add a little intimacy or "closeness" to a family portrait pose of 4, have your subjects lean in a little toward the middle of the photo. This brings their heads closer together and connects them. This pose of these 4 sisters was a copy of a pose they had done many, many years ago.They had a print on hand of the original pose and it was easy for me to copy it. If you see a pose you really like, use it at the first opportunity. You'll learn it and remember it that way. 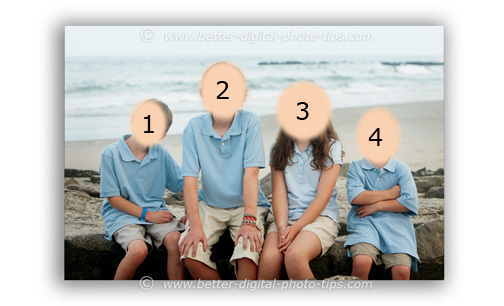 In addition to family portrait poses for 4, here are some more group photo poses you can copy for other group picture numbers. Posing ideas for 3 people. Five different sample group shots of 3 people, four of them are outsie photos and the last one is an indoor shot. Photography Poses for 5 People. How to do photography poses for 5 people. Photography Poses for 6 People. A little more complicated than posing groups of 4 people is doing groups of 6 people. Shoot more. Watchless.